Plants annual. Culms 30-100 cm; nodes pubescent, hairs appressed. Sheaths with ciliate margins; ligules ciliate; blades to 12(25) cm long, to 10(20) mm wide, flat, hispid on both surfaces. 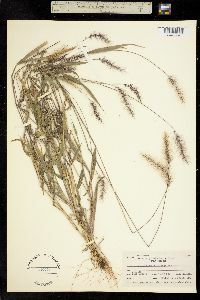 Panicles 3-18 cm, loosely spicate, interrupted, often purple; rachises hispid; bristles 1-3, 5-15 mm, flexible, antrorsely scabrous. 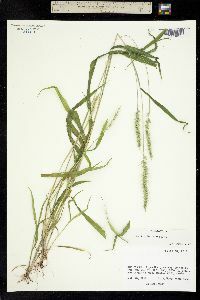 Spikelets 1.5-2.2 mm. 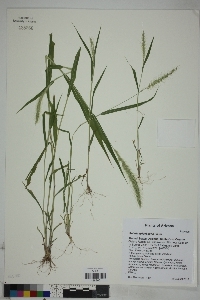 Lower glumes about 1/3 as long as the spikelets, distinctly 3-veined, lateral veins coalescing with the central veins below the apices; upper glumes nearly equaling the upper lemmas, obtuse, 5-veined; lower lemmas equaling the upper lemmas; lower paleas about 1/3 as long as the lower lemmas, narrow; upper lemmas finely and transversely rugose; upper paleas similar to the upper lemmas. 2n = unknown. 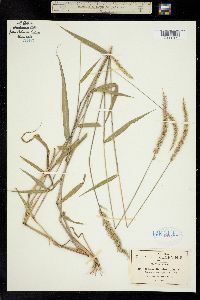 Setaria grisebachii is the most widespread and abundant native annual species of Setaria in the southwestern United States. It grows in open ground and extends along the central highlands of Mexico to Guatemala, usually at elevations of 750-2500 m. The specimens from Maryland were collected on chrome ore piles; the species is not established in the state. Annuals, Terrestrial, not aquatic, Stems nodes swollen or brittle, Stems erect or ascending, Stems geniculate, decumbent, or lax, sometimes rooting at nodes, Stems caespitose, tufted, or clustered, Stems terete, round in cross section, or polygonal, Stem nodes bearded or hairy, Stem internodes solid or spongy, Stem internodes hollow, Stems with inflorescence less than 1 m tall, Stems, culms, or scapes exceeding basal leaves, Leaves mostly cauline, Leaves conspicuously 2-ranked, distichous, Leaves sheathing at base, Leaf sheath mostly open, or loose, Leaf sheath smooth, glabrous, Leaf sheath hairy at summit, throat, or collar, Leaf sheath and blade differentiated, Leaf blades lanceolate, Leaf blades 2-10 mm wide, Leaf blades 1-2 cm wide, Leaf blades mostly flat, Leaf blades more or less hairy, Leaf blades scabrous, roughened, or wrinkled, Ligule present, Ligule a fringe of hairs, Inflorescence terminal, Inflorescence a contracted panicle, narrowly paniculate, branches appressed or ascending, Inflorescence solitary, with 1 spike, fascicle, glomerule, head, or cluster per stem or culm, Inflorescence spike linear or cylindric, several times longer than wide, Peduncle or rachis scabrous or pubescent, often with long hairs, Rachis angular, Flowers bisexual, Spikelets pedicellate, Spikelets dorsally compressed or terete, Spikelet less than 3 mm wide, Spikelets with 1 fertile floret, Spikelets with 2 florets, Spikelet with 1 fertile floret and 1-2 sterile florets, Spikelets solitary at rachis nodes, Spikelets all alike and fertille, Spikelets bisexual, Spikelets disarticulating below the gl umes, Spikelets all subtended by bristles, Spikelet bristles 1-3, Spikelet bracts bristles not disarticulating with spikelets, Rachilla or pedicel hairy, Glumes present, empty bracts, Glumes 2 clearly present, Glumes distinctly unequal, Glumes shorter than adjacent lemma, Glume equal to or longer than spikelet, Glumes 3 nerved, Glumes 4-7 nerved, Lemmas thin, chartaceous, hyaline, cartilaginous, or membranous, Lemma similar in texture to glumes, Lemma becoming indurate, enclosing palea and caryopsis, Lemma 5-7 nerved, Lemma glabrous, Lemma rugose, with cross wrinkles, or roughened, Lemma apex acute or acuminate, Lemma awnless, Lemma margins thin, lying flat, Lemma straight, Palea present, well developed, Palea shorter than lemma, Palea 2 nerved or 2 keeled, Stamens 3, Styles 2-fid, deeply 2-branched, Stigmas 2, Fruit - caryopsis.